Cabo Villa Rentals - Del Sol Golf Club - Vacation Rentals in Los Cabos, Baja California Sur, Mexico. A world-renowned Jack Nicklaus Signature design stretching for more than a mile along a coastline of craggy rock outcroppings and sun-washed shores. This championship layout is praised by Nicklaus himself for having the three finest finishing holes in all of golf. The 5th and signature 17th holes are currently ranked among The 500 Best Holes in the World according to Golf Magazine (January 2000). Cabo del Sol currently offers 24-hour customer service for tee time reservations. Guests of Cabo del Sol resorts (Fiesta Americana and Sheraton Hacienda del Mar), or other Los Cabos area hotels may call our toll-free number at 1(800)386-2465 or click on Tee Times to book an advance reservation. Full payment for green fees is required in advance. The Vista Course, Cabo del Sol's third championship layout, will be a Tom Doak/ Mark Parsinen design. With their combined experience and expertise in developing high-end, internationally recognized golf courses, The Vista Course is destined for world-class recognition. 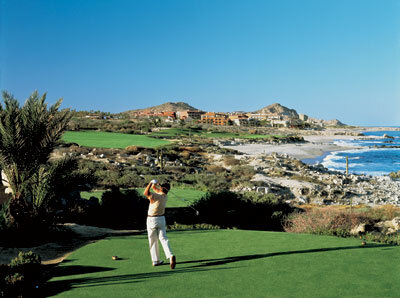 The vision at Cabo del Sol is excellence in golf. The developers of this golf resort community are creating the foremost golf experience in the world by bringing together the best in golf course design and management with the highest U.S. standards of play. Cabo Del Sol Golf Course.